Smith, William. A new classical dictionary of Greek and Roman biography, mythology and geography. — New York : Harper & Brothers, 1884. — xv, 1039 p. incl. tables : plan. 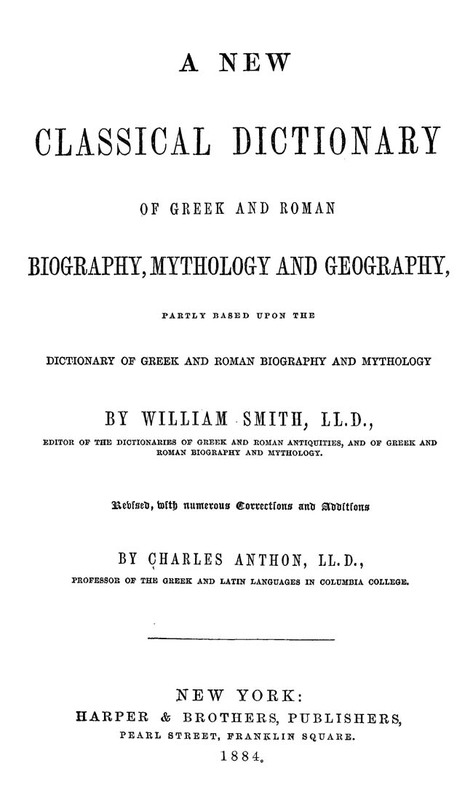 A Classical Dictionary, Biographical, Mythological and Geographical. Map of Ancient Rome, etc. Chronological Tables of Greek and Roman History, etc. Rules for the Conversion of the Olympiads, etc. Chronological Tables of Greek History, etc. Chronological Tables of Roman History, etc. Athenian Archons Eponymi, from B.C. 496 to B.C. 912.